They proved they’re the best at Australia’s biggest esports event. 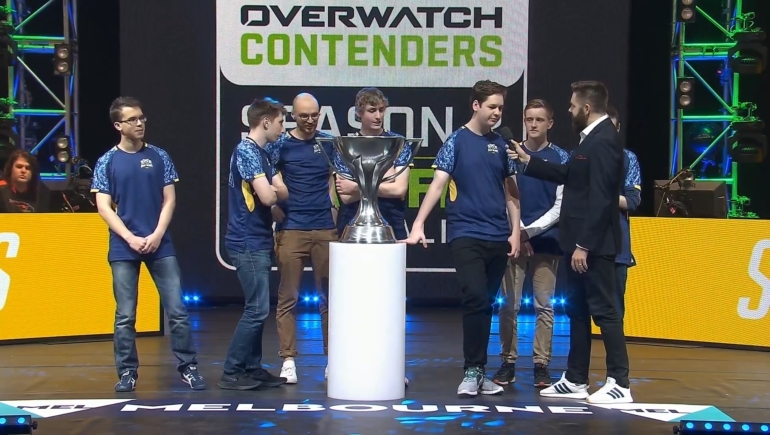 The biggest event in Australian esports, the Melbourne Esports Open at the Rod Laver Arena, kicked off the day with the final two rounds of the Overwatch Contenders Australia Season Two playoffs. Thousands of fans in the audience and on Twitch watched as a new Australian Overwatch dynasty was born. Sydney Drop Bears are back-to-back champions in the outback, taking their second Contenders title in a row to prove they’re Australia’s best side. And they earned the opportunity to lift a comically-oversized trophy on the big stage. Drop Bears dominated the regular season, winning every single map they played, and they continued that dominance in the playoffs. They opened the day with an easy win in the semifinals over Kanga Esports with what was essentially a 4-0 three-game series, with referees declaring the second map needed to be replayed after it finished. They then followed up the win with a 4-1 tally against rivals Dark Sided, and while the match was much closer than the scoreline indicates, by the end there was little doubt as to who deserved the championship. Sydney Drop Bears showed they have the knowledge and execution to play a variety of team compositions and the ability to make the right adjustments on the fly, as well as the skill and ability to perform on stage. They showed that they’re true champions. The team fields a lineup that features a list of players many call the best in the region at their positions, and they lived up to that reputation today. Sam “Quatz” Dennis and Marin “Shoyo” Tomicic proved that they’re the league’s best tank line. Dario “Akraken” Falcao-Rassokha showed why he’s Team Australia’s flex support in the Overwatch World Cup. Jordy “Jordation” Frish showed why he’s called the best Hanzo in the league. And, of course, the DPS superstar from New Zealand, Kelsey “Colourhex” Birse, proved why he’s the region’s biggest rising star. Their finals opponents, Dark Sided, at least made sure the day was an exciting one. Like Drop Bears, Dark Sided put together an undefeated regular season, topping Group B while Drop Bears reigned over Group A. They feature a lineup combining veterans like James “Yuki” Stanton and Jake “termo” Hickman, with rising stars like flex tank Leyton “Punk” Gilchrist. But Dark Sided faced stiff competition in the semifinals. The rising team of young up-and-comers ORDER built off their semifinal appearance last season to nearly topple Dark Sided, taking them to five extremely-close games that could have gone either way. Dark Sided took the first map of the semifinal series, Ilios, with ease, and carried their momentum onto ORDER’s map pick, King’s Row, nearly holding ORDER on the first point before stopping them in the streets. Their attack opened fast as Yuki scored two quick kills and an early Dragonblade, giving Dark Sided around five minutes to finish the street phase of the map. But ORDER showed the resilience they didn’t have in season one of Contenders, surviving Dark Sided’s onslaught by the skin of their teeth and even a last-second overtime turnaround to hold off Dark Sided and tie the series. ORDER took the next map, Anubis, in another close bout, highlighted by a creative (yet questionably effective) Bastion and Symmetra cheese strategy. Dark Sided selected Rialto, and it was almost a disaster. ORDER held them inches from capturing the first checkpoint, a distance that should be easy to surpass with an average attack. But Dark Sided survived. The combination of Jake “Termo” Hickman’s Graviton Surge and Leyton “Punk” Gilchrist’s Self-Destruct with one minute left turned around a lost fight and kept Dark Sided alive in the tournament. The decider, Lijiang Tower, was just as close as the rest of the series, but despite ORDER taking the first round, Dark Sided and their experience won out, sending them to the grand finals. Dark Sided weren’t intimidated by the defending champions Sydney Drop Bears, and they showed it on the opening map, Lijiang Tower, making a statement that the series would be a competitive one. Drop Bears picked Eichenwalde to tie the series, and while they accomplished that task, it took an overtime push after capturing the point with less than a second on the clock to do it. Dark Sided nearly made the series 2-0, but Drop Bears came through in the clutch. That became the theme for the rest of the match. Dark Sided picked Volskaya and then Rialto, and while they put together solid attacks on both maps followed by strong defenses, Drop Bears came through in the end on both maps. Dark Sided looked defeated on the final map, Ilios, with no answer to the Bears’ onslaught. Colourhex, the Drop Bears’ lone offseason addition, showed why they added him to their championship-winning team throughout the series. His Pharah was often the key to pulling out the clutch fight wins they needed to secure the title. Colourhex called winning the title “the best moment of his life” in a quick post-game interview. For the young superstar, though, this moment may only be the beginning. Yesterday, Toronto Esports, the Overwatch Contenders North America team affiliated with Boston Uprising, announced they had acquired Colourhex ahead of season three. There’s already one player from the region competing in the Overwatch League, Australian national and Los Angeles Valiant support player Scott “Custa” Kennedy. If all goes well as the New Zealander Colourhex moves to America, there may soon be another. Sydney Drop Bears will certainly miss Colourhex when they attempt to defend their crown next season, but the two-time champs already showed they have what it takes to win without him in the lineup in season one. And today, they proved that whoever they get to replace him, they’re still the team to beat.